Implantology offers solutions for all forms of edentulism and is an ideal choice for those who are unhappy with their classic prosthesis. Dental implants have been used to replace missing teeth since the mid-1960s, but in recent years their use has become much more widespread. They can be used to support crowns replacing single missing teeth, bridges that restore a larger span of missing teeth. Implants are manufactured from titanium, a metal that is known to be compatible with body tissues and able to bond with adjacent bone during healing. There is a now a wealth of evidence from studies and from clinical experience to show that dental implants are a safe and convenient way to replace lost teeth with natural-looking results. Implants look and feel like natural teeth. Implants function in the same way as natural teeth and there are no difficulties with eating or cleaning the teeth. Healthy adjacent teeth do not have to be filed down to act as supports for the missing tooth or teeth. This means that they are therefore less likely to need root fillings. 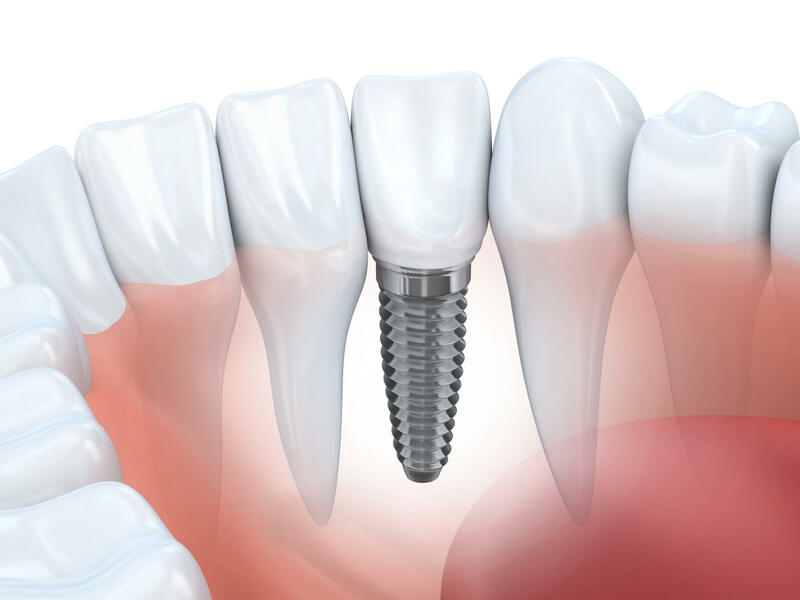 The presence of the implant maintains the structure of the bone beneath the replaced tooth, as chewing forces are transmitted through the implant to the bone and stimulate the natural process of bone renewal. This helps preserve a good appearance, both of the restored teeth and of the face. Dental implants can be used to give removable dentures a firm grip. With dental implants, there is no need to use special glues to hold the false teeth in place, as there is with some dentures.